Scrum is an Agile method designed to add energy, focus, clarity, and transparency to project planning and implementation. While some say Scrum is not a silver bullet, it can be a heat-seeking missile to outmoded business practices. Take a moment to re-read that quote. What you’ll notice is that scrum is more than a simple recipe of steps to doing development. Scrum is a fundamental shift in the mentality of how work gets done. In other words, Scrum is not something that you can adopt bits and pieces of and expect to succeed. Scrum is really an all-or-nothing approach if you want to fully reap the benefits that Sutherland professes. 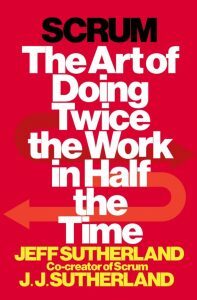 As such, what you’ll notice in the book is that Sutherland spends a lot of time talking about culture, team dynamics, and approaches to how work gets done. Don’t get me wrong, he gives you plenty of practical tips that you can implement. However, if you don’t buy into the underlying foundation of beliefs that Scrum is built upon, the practical tips won’t work. Having said all of this, I liked Scrum a lot. I’ve read a number of software development books over the last couple of years. I’m particularly interested in modern software development frameworks and ideas around Agile development and Scrum methodologies. What I’ve found is that the majority of software development is around culture and mindset, and then the methodologies and techniques. Scrum covers all of these areas, and does it well. What I particularly liked about Scrum was that Sutherland spend a lot of time on the “why” that makes Scrum work. He doesn’t spend a lot of time on the “how”, but that is where other books such as User Story Mapping shine. Really, there are three books that I would recommend you read when it comes to software development. The first is Mythical Man Month. Mythical Man Month give you a classic overview of the key issues and misconceptions around software projects, particularly large ones, and how to overcome them. Next you should read Scrum to build a strong foundation around Agile development. Then I would recommend User Story Mapping. User Story Mapping goes deeper into the mechanics of Agile development and scrum. I liked Scrum so much that I’ve been taking excepts from the book and sharing them with my staff. It’s sparked a number of interesting discussions and has highlighted areas where we need to improve our culture, mindset, and processes. We’re still digesting and learning how to apply the concepts better. We’ve made a commitment to get better at using Scrum starting this month. It will be interesting to see how it affects the pace and quality of our project and product developments during 2018. Scrum is clearly a Must Read, and not just for software development. Sutherland covers numerous examples of how Agile development and Scrum have been used in non-software businesses. It’s worth taking a look at. You might be surprised at how the concepts can transform your business and project developments.